With 673 incidents of anti-Shiism during the month of April, Shia repression is on the rise. The reduction in February and March from January’s equivalent 673 incidents was too good to be true, as this month concluded with 128 deaths, 180 injuries, 236 arrests, 114 sentencing, and 18 other anti-Shia actions such as denial of healthcare, as well as violent and legal attacks on basic human freedoms and rights. The amount of Shia civilians killed this month around the world increased by 100% from what we’ve previously seen in recent months, jumping from an average of 60 deaths per month to 123, and showing a new wave of violence and aggression directed at Shia Muslims. With violence at a recent high, open discussions about minority rights are more important than ever. The mayhem in Afghanistan continued to increase this month with continual attacks on the Shia population carried out by extremist groups in the region. The Hazara Shia community in Afghanistan is regularly a target of terrorist groups, leading to 77 deaths and 132 injuries this month. The assaults this month began on April 9th, with the detonation of an IED which was attached to a motorcycle in Herat province. The blast killed eight people immediately, four of which were children, and wounded nine other minors. In the 48 hours between April 17th and 18th, six Shia Muslims were killed and four others were wounded in two separate attacks on vehicles. The first incident took place as four Shia Muslims were traveling near Faroz Koh. All passengers were injured, but no casualties were reported. The second attack came as six Shia civilians were traveling from Herat to Ghor. Their car came under attack by extremists, and all six of the passengers were killed. The end of the month brought a mass killing of Hazara Shia in Kabul, as the civilians were attempting to register to vote in the upcoming October elections. According to reports, a Daesh-affiliated suicide bomber detonated an explosive device in the doorway of the voter registration center, killing 57 Shia Muslims and injuring 119. Of those killed were 21 women and five children. On the same day, six other Shia civilians from the same family were killed in their vehicle by a roadside bomb in Baghlan’s Pul-e-Khumri city near another voting facility. The ruthless attacks against innocent Shia civilians, with merciless disregard for age or gender, shows the animosity of the extremist ideologies which lead people to target the Shia Muslim populations around the world. The decreased presence of extremist groups such as ISIS in Iraq and Syria has resulted in a migration of these militants to Afghanistan, where their anti-Shia motives are wreaking havoc on the Shia population. Nigerian Shia continues to face a backlash from their government and punishment for peacefully protesting the detainment of Sheikh Ibraheem Zakzaky, Nigeria’s most prominent Shia scholar, who has been detained without charges since December 2015. Protests calling for the release of Sheikh Zakzaky spread from Nigeria to Turkey, Indonesia, and Pakistan this month, expressing the importance of the cleric to the Shia population internationally. The continuation of Nigerian Shia population’s “Free Sheikh Zakzaky” protests were met with extreme police force this month, as law enforcement clashed with protesters for three consecutive days during the middle of the month. Police used tear gas and gunfire in an attempt to disperse protesters from the congregation. The brutality resulted in three deaths, two injuries, and 230 arrests, and came a week after the daughter of Sheikh Zakzaky declared that Nigerian officials were continuing to deny her father necessary medical treatment for his deteriorating glaucoma. Police have continually attempted to stop Nigeria’s Shia population from protesting the arbitrary detainment of their religious movement’s leader. Forces occupied the Unity Fountain early in the month to prevent protests from taking place. The resilience of the Shia population in Nigeria to continue advocating for their own justice did not allow for the police occupation to defeat them, and instead, they moved their peaceful protest to the entrance of the National assembly. A week later, just after the funeral of the one man, Ahmad Rufai Abubakar, who had been shot and killed in the clashes at the protests, the funeral party staged a protest in front of the National Human Rights Commission in Abuja. During the protests against the human rights violations of the Nigerian police, the police forces opened fire once again on the crowd, taking the lives of two more Nigerian Shia, and injuring an unknown number of people. Nigerian officials continually attempt to suppress the Shia Islamic movement in Nigeria by trying to silence to protests which stand up against injustice. The Shia population continues to fight for their freedoms and has shown unwavering determination to secure fair treatment for its population. Meeting police force with peaceful demonstrations sets an example for all Shia Muslims in how to overcome government repression. Bahrain experienced a 53% decrease on individual attacks this month, dropping from 238 in March, to 133 in April. This decrease, however, is only superficial, and the attacks on the Shia population in Bahrain this month revealed themselves in different forms. This month, Bahrain saw two injuries, four arrests, 114 sentencing, and 13 other anti-Shia actions such as denial of medical treatment, unwarranted house raids, and the passing of a bill that is intended to prevent Shia Muslims from participating in elections. The month began with an eight-day siege of the Shia village of Ma’Amir by security forces. The forces placed cement barriers and checkpoints around the village and searched every person who entered and exited the village. It is not known what the purpose of this siege was, but it is common practice for Bahraini officials to place Shia villages under occupation in an attempt to restrict movement of the majority population. Most notable was the nearly year-long seizure of Diraz, the home of Bahrain’s prominent Shia cleric, Sheikh Isa Qassim. The government’s unwarranted routine invasions did not end at the Ma’Amir village though, as the homes of Maytham Mohammed, Sayed Qassim Sayed Khalil, Sayed Mahmoud Sayed Adel, and Hassan al-Bahrani, four Bahraini youth who were killed at sea in February, were raided and intrusive searches were conducted without any given reason. Bahrain continued its practice of arbitrary arrests with the detainment of Ahmad Abd Al-Ali Al-Aali, from the town of Aali on April 13th. Al-Aali was taken to an undisclosed location, and the reason for his arrest is unknown. Similarly, Mohammad Al-Karani from Karana village was arrested for unknown reasons and transported to an undisclosed location this month. Just days before Al-Karani’s arrest, massive peaceful protests broke out leading up to the Formula One Grand Prix in Manama, and Shia civilians were met with tear gas and water cannons administered by security personnel. A Shia eulogy reade, Haj Hassan Khamis Al-Nuami was arrested at the end of the month for participating in the celebrations of Imam Hussein’s birthday, and for singing a popular Shia song with lyrics that say “I have become sick of sitting in Bahrain, O’ mother…Bring my passport so I could travel to Karbala to visit Al-Hussain”. He is currently being detained while an investigation takes place. Given Bahrain’s pattern of criminalizing innocent Shia on fabricated charges of terrorism, it is likely that Al-Nuami will face trial for the incident. The final arrest for the month came at the expense of Mansour Hussein, a Bahraini Shia youth who was arrested in a string of home raids carried out by Bahraini security forces. The reason for his arrest is unknown, in line with Bahrain’s practice of arbitrary arrests. He was forcibly removed from the village of Buri on April 27th, and transported to an unknown location. Bahrain saw 114 civilians sentenced to prison this month, 26 of which were also stripped of their Bahraini citizenships. The first sentencings were on the charges of “illegal assembly”, in which two Shia were sentenced to one year in prison, and four others were sentenced to two years. This case exemplifies Bahrain’s crackdown on its Shia population’s basic human rights, such as the right to peaceful assembly, and shows the desire and preference of Bahraini authorities to repress its Shia population and to put them behind bars. This month, 18 more Shia civilians were referred to trial two days later, on false allegations of forming a terrorist group. The claim made by the Bahraini authorities is entirely unfounded, as several of those accused in the formation of the group are already serving time in prison for other fabricated charges, and therefore could not take part in the formation of a group outside of the strict prison walls. Referring these 18 Shia civilians to trial furthers the reality that Bahraini authorities want to put and keep, as many Shia Muslims in prison as possible, to suppress their desire for political justice and instill fear in those who speak out about the Regime’s human rights violations. Further falsified allegations of terrorism led to the sentencing of four Bahraini Shia, three of which received five years in prison, and one of which received three years on April 17th. In the 48 hours between April 19th and April 20th, 66 Shia Muslims in Bahrain were sentenced to prison by the Fourth High Criminal Court, and 26 were stripped of their nationalities in four separate cases. In the first case, 32 people were charged with fabricated allegations of terrorism. Of the 32, 25 were handed down seven-year prison sentences, and the remaining seven were sentenced to three years each. The second case came on related charges and resulted in three Shia citizens being sentenced to life in prison, and two of the three being revoked of their citizenships. This revocation pushed the number of Shia in Bahrain who has had their citizenship stripped by the government since 2011 to reach over 600, shedding light on the brutal government crackdown against the majority Shia population. The third case resulted in the sentencing of 10 Shia to life imprisonment, 10 others to 10 years in prison, three defendants to five years’ imprisonment, and a final person to three years. All 24 of the defendants had their citizenships stripped as part of the ruling. The charges brought this group of 24 Shia civilians were allegedly ‘forming a terrorist group’, and affiliating with Iraq and Iran, a pattern that holds true to the majority of sentencings against Shia in Bahrain, which routinely uses false allegations of terrorism as an excuse to repress. Lastly, seven Shia youths were sentenced to two years in prison each, on allegations similar to the 59 sentenced before them. The Military Court of Cassation also upheld the death sentence of seven men, Adel Mubarak Muhanna, Fadel Sayyed Abbas Hassan Radhi, Sayyed Alawi Hussein Alawi Hussain, Mohamed Abdulhassen Ahmed al-Matghawi, Mohammed Abdul Hussain Saleh al-Shihabi, Mohammed Abdul Wahid Mohammed Al-Najjar and Hussein Mohammed Ahmed Shihab, on April 25th for an alleged act of terrorism. In a string of trials held between April 28th and 29th, 13 Shia Muslims were sentenced to prison in four separate cases. As an outcome of the first of these trials, the 15-year prison sentences against 5 Bahraini Shia, arbitrarily arrested and accused of committing a crime, were upheld by the partisan court system. The second trial sentenced a single defendant in absentia to five years in prison on allegations of a terrorist crime. The reasons for the defendant’s absence is unknown, however, the sentence de-legitimizes the Bahraini criminal court, as sentencing a citizen to prison without allowing for him/her to defend him/herself is an unjust practice and shows that the court is not concerned about bringing justice, but rather oppressing its Shia population. The third sentencing in the two-day crackdown resulted in the imprisonment of four Shia citizens for two years each on similar accusations to the rest of April’s sentencing. The final sentencing for the month of April came as three defendants were handed down three-year prison sentences for accusations of affiliating themselves with the court-dissolved Al-Wafaa Shia political party. The sentences come as another effort by the Bahraini government to silence those who speak out in favor of justice and against human rights offenses, calling for government reform. Bahrain’s efforts to scare the Shia population into submission is well executed, as the standard of living in prison is bad enough to deter citizens from doing anything that would result in a sentence. Bahrain’s prisons are unsanitary and often result in health deterioration of their prisoners. However, Bahrain regularly denies healthcare to the ill in prison, leaving them to suffer immensely. This month, Mohammad Fathi, who is currently serving 14 years in prison, suffered from a cancerous tumor in his head and was denied medical treatment repeatedly. The tumor continued to grow until it was apparent that he needed immediate medical care, to which he was operated on in an extremely dangerous procedure, which would typically require a long stay in the hospital for recovery purposes. However, in line with Bahrain’s maltreatment of its prisoners, Fathi was immediately transferred back to prison after he awoke from his anesthesia, with no chance to heal before being thrown back into the unsanitary conditions. Another prisoner suffering from cancer and in an already-weakened state. Elias Al-Mullah, fractured his leg after falling in the prison field this month. The prison administration refused his request to transfer to the hospital for treatment, and he remains in bad health with no access to the medical attention he needs. The government of Bahrain would prefer not to publicize the brutal conditions of its detainment facilities to the world, and made that clear this month when they denied a Danish member of parliament access to the country, where he had plans to visit and advocate for Danish-Bahraini citizen Abdulhadi al-Khawaja, a human rights activist sentenced to life in Bahrain over political charges and his participation in the 2011 mass protests. The refusal to allow a Danish lawmaker access to a Danish citizen detained in Bahrain is a statement made by the Bahraini government which exemplifies its human rights malpractice. The malpractice goes far beyond actions carried out by the government but is instilled in the laws of the country. This month, the Bahraini government passed a bill that bans people who were sentenced to criminal offenses or imprisonment in premeditated crimes, for any amount of time beyond six months, from running in a political election. Given the common practice of imprisoning human rights activists and innocent Shia Muslims in Bahrain, the bill singles out the Shia population by restricting a large number of political and religious leaders from ever participating in the politics of the country, making the repression, not just short term, but permanent. Not only does it ban those imprisoned from running in an election, but it restricts those who were and are members of political societies that were permanently dissolved in a judicial verdict from running in an election. On February 20th, 2018, the Manama Courts upheld a 2016 decision to dissolve the Al-Wefaq party, the major Shia political party in Bahrain. This new bill is essentially an enforcement of that decision, and any others that were similar, and bars the Shia political leaders from holding any office within the government, in an attempt to further silence Bahrain’s Shia. Lastly, Bahraini security forces exhibited a blatant act of anti-Shiism at the end of the month when they bulldozed the Imam al-Askari Shia mosque in Hamad without prior warning. This blunt act of religious discrimination is not the first, but the second time that they have demolished this Shia place of worship; The first destruction took place in 2011 during the uprising, in an attempt to batter and bruise the Shia population at the basis of their faith. April’s statistics make it clear that Bahrain is continuing to increase its efforts to repress its majority Shia population, with nearly double the amount of sentencings of March and a new law to restrict those who have been imprisoned from ever being the political change that Bahraini Shia seek. The offenses against the population in Bahrain are not only recurring but institutionalized, with the entire legal system revolving around the repression of Shia Muslims. Bahrain must embrace its majority population and cater to the needs of all of its people, rather than treating the largest portion of its people, Shia Muslims, as second-class citizens, and not citizens at all. 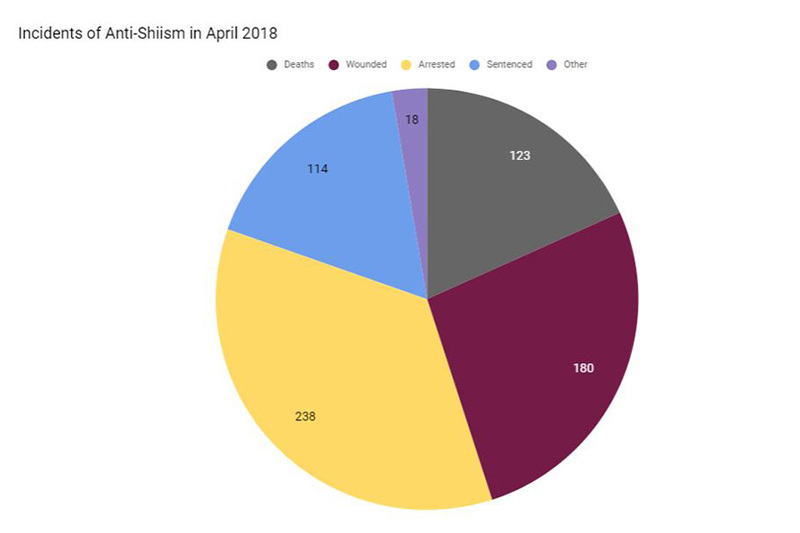 Iraq continued to see a decrease in extremist attacks this April, totaling 64 incidents of Anti-Shiism, to last month’s 74 incidents, and just ⅓ of April 2017’s 188. The attacks, however, killed more than double the amount of Shia Muslims than March, showing that the ruthlessness of the takfiri terrorist groups has not decreased. The beginning of this month’s attacks against Shia Muslims started on April 2nd when a sticky explosive device that was placed under the wheel of a car was detonated in Bayaa area of Baghdad. Daesh immediately claimed responsibility for the attack and said that they injured five Shia Muslims. Two days later in the area of Dujail, south of Salah al-Din, an IED was detonated in the village of Sjla. Reports say that the explosion injured three people. No deaths were reported. On April 6th, one Shia was killed by Daesh with an IED in the Khazaaliya area of Baghdad, and three others were injured in a separate incident when unknown gunmen opened fire with machine guns at a popular cafe in the Palestine Street area of the city, injuring three civilians and causing physical damage to the cafe. Just short of one week later on April 12th, four more Shia Muslims were killed while traveling through Baquba city when an IED placed by Daesh exploded, destroying their vehicle and killing all of the passengers. April 13th once again exemplified the inhumane nature of takfiri extremist groups when a bombing took the lives of 25 Shia Muslims and injured 18 more, all of whom were attending a funeral for Shia paramilitary fighters who had been killed the day prior by Daesh. Although no group immediately claimed responsibility for the attacks, it can be assumed that Daesh wanted to continue their rampage by killing the families and loved ones of the paramilitary fighters as well, and are responsible for the carnage. While much effort has been exerted and has succeeded in driving extremists out of Iraq, the threat that the remaining militants pose to the Shia population continues to hold strong, as the takfiri ideology present in the minds of these groups motivates their murderous actions. Iraq appears to be traveling down a positive path towards significantly reducing, and defeating the presence of anti-Shia sentiment in the country, and must continue to expel the extremist groups that are causing the violence to linger. Pakistan’s anti-Shiism remained steady this month with the ongoing pattern of targeted extremist attacks. Wreaking havoc in Pakistan among the Shia population is the Ahle Sunnat Wal Jamaat (ASWJ) group, a Deobandi group which considers those of the Shia sect to be non-Muslim heretics. This month in Pakistan, extremists were responsible for the deaths of 13 Shia and the injury of 15. On April 1st, Daesh-affiliated ASWJ terrorists opened fire on a vehicle in Quetta’s Kandahari Bazaar area. Two passengers, both Shia, were wounded by the bullets, which ultimately killed one and left the other in critical condition. Two days later on April 3rd, the body of a Shia student who disappeared on February 7th this year was discovered in an empty train car in Karachi’s City Railway Colony. A police investigation concluded that the murder was motivated by sectarian sentiments after the Shia family received a text demanding ransom money in exchange for their son’s life. Later in the month, in a tactic not typically seen in Pakistan, an explosive device was used to target security personnel in the Shia-dominated city of Quetta. The device did not cause any casualties but injured five security officers who were nearby at the time of detonation. Another man, Mohammad Asif, son of Mohammad Nasir Qandahari, was shot and killed this month when gunmen assumedly affiliated with the ASWJ group opened fire while riding by on motorcycles. Mohammad Asif was a shopkeeper within the Hazara Shia community in Quetta, a city in Pakistan regularly targeted by extremist groups. Again in Quetta, two men, identified as Muhammad Ali and Muhammad Zaman, were killed in a terrorist attack. The two men were members of the Balochistan Shia Conference, as well as a part of the Hazara Shia community. A third man was injured as a result of the attack, however, his injuries are not critical. Towards the end of April, six Shia were killed and another eight were injured in three separate suicide bombings in Quetta. The first bombing took place as a man drove his explosives-laden motorcycle into a van filled with security personnel while they were traveling to the airport. The explosion killed all six of the traveling passengers. The second and third bombings occurred as suicide bombers detonated their devices at security checkpoints just outside of the city, injuring 8. Closing out the anti-Shia violence in the month of April, two Shia members of the Hazara community in Quetta were killed when extremists opened fire at an electronics shop on April 28th. The two victims were identified as Jafarullah Ghulam Ali and Mohammad Ali Wali Khan Ali, and both were pronounced dead after being transported to the nearest hospital. The shooters fled the scene as soon as they finished firing, and are unidentified in both identity and extremist affiliation. A delegation from the Shia Hazara community met with the Chief Justice of Pakistan, Mian Saqib Nisar this month in Quetta. They spoke with him about the problems they have been facing due to extremism in Quetta, and thanked him for the strides he had been making to protect their rights and safety. The chief justice said that he would continue to work to solve their harassment through legal means and incorporate the law to bring those who have acted illegally to justice. While the death toll in Pakistan is not as high as countries such as Iraq, or Afghanistan, the threat of extremism against Shia Muslims should not be overlooked. An attack on the Shia community, whether large or small, is an attack nonetheless, and representative of an anti-Shia ideology that is present and active in the region which must be solved through unity and religious tolerance. Saudi Arabia’s anti-Shiism comes in the form of religious intolerance via government policies. Often times Shia in Saudi are repressed through arbitrary arrests and unwarranted home raids carried out by security forces, rather than violent attacks orchestrated by extremist groups. While most of Saudi Arabia’s judicial actions are undisclosed, and therefore the exact number of anti-Shia actions is not known, there were four reported arbitrary arrests of Shia Muslims in the country this month in a series of attacks against the Shia-majority Eastern region. Saudi forces launched a raid on the Husayniyat al-Kuwaikib in Qatif during the second week of April, arresting the three men who were inside the Husseiniya at the time. The forces also surrounded multiple neighborhoods in Qatif, setting up checkpoints and restricting Shia from entering or leaving the areas. Reports said that in a separate incident on the same day, a unit of Saudi forces fired an explosive at a house in Kuwaikib without providing a reason for their actions. No casualties were reported. A female activist was also arrested by Saudi forces this month in Qatif after an investigation into her online posts and pro-Shia activism; 19-year-old Nour Said al-Musallam was taken into custody by Saudi security forces after her Twitter posts from as far back as 2015 were deemed unacceptable due to her unfavorable opinions on local and regional developments, likely about Saudi Arabia’s oppression of Shia Muslims. She is also an avid defender of local Shia mosques and congregation sites against potential threats to her places of worship and people of her faith. Saudi Arabia’s detention of a Shia activist due to her political beliefs and peaceful acts of religious protest shows a flaw in their justice system, as all citizens should be allowed both the freedom to an opinion and a freedom of religion. Saudi Arabia’s religious government allows for abuses against those who do not follow the same school of thought as the country’s political and religious leaders. The Shia in Saudi Arabia’s Eastern province continually experience human rights violations including arbitrary arrests, harsh sentences, and prison torture, and are restricted from freedom of religion, speech, congregation, movement, and their right to medical care and education. Saudi Arabia’s harsh policies and practices against the Shia minority in the country must end. As such a prominent Islamic country in the Middle East, home to both Mecca and Medina, Saudi Arabia’s government should practice peace and acceptance towards all sects of Islam, and all Muslims, setting an example for the rest of the Islamic world. The first quarter of 2018 brought with it a surge of anti-Shiism, resulting in the deaths of 293 people, and wounding 670 others. 555 Shia were arbitrarily arrested, 573 were sentenced to prison, and a number of other anti-Shia incidents took place which denied basic human rights and freedoms to Shia Muslims. So far this year has stood witness to 2,163 occurrences of anti-Shiism in total, averaging 18 incidents per day. In perspective, imagine 18 of your friends, family members, colleagues, or acquaintances were assaulted, killed, or arrested every day this year since January 1st. Anti-Shia sentiment is a serious problem that is affecting millions of people worldwide every day. Shia Rights Watch condemns those who jeopardize the safety and rights of Shia Muslims around the world and invites all people to join in advocating for and defending their freedoms.